As I enter the last week of my internship at Jalopnik, I’ve realized that—despite having a massive platform through which I can reach hundreds of thousands of people—I’ve yet to shamelessly profit off of this position by manipulating markets. 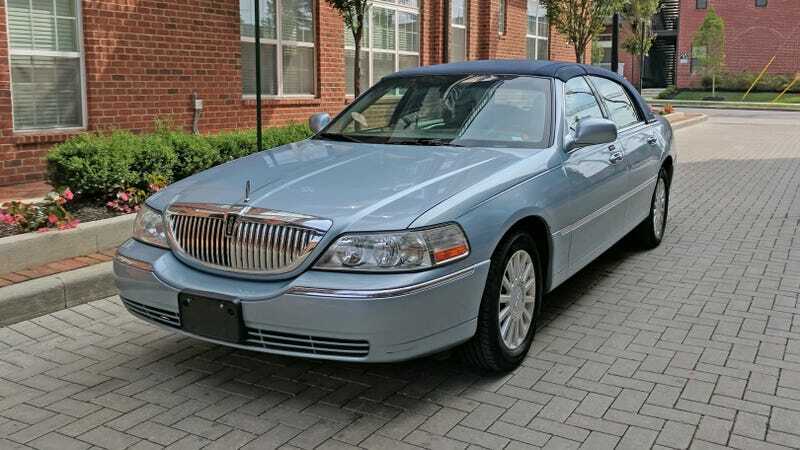 Today, I’m going to tell you about the best budget driving experience on the market: A 2006 Lincoln Town car with a landau top, preferably in a bright color. Not only that, but I happen to know a tall, handsome, ethically-questionable person selling his at this very moment. And for you, lovely reader, I’m sure he’d cut you a helluva deal. Also, if you’d be so polite as to not read the bio at the bottom of this article before unquestionably heeding my advice, that’d be great. A small minority of you may incorrectly perceive the Lincoln Town Car as a ponderous, floaty land barge as far removed from the concept of driving excitement as Dodge is removed from the concept of making new models with fewer than 700 horsepower. But you’re wrong, the mighty Town Car has all of the ingredients of a fantastic sports car. First off, it’s got a V8. And it was made by the Ford Motor Company. In that way, it is essentially a GT350R. Sure, it may not come stock with the same exhaust note of the GT350R, but the Town Car is so focused on driving pleasure that it sometimes intentionally starts rattling from the catalytic converter, causing you to contemplate straight piping it. Not that I know that. And while GT350R must pay an extra $999 to go from two to four seats, Town Car buyers get the luxury of six seats as standard. So in many ways it is similar to the GT350R, but in some ways it’s even better. Ah, you may say, your dear author is forgetting about the magnetic suspension on the GT350R. Au contraire! Because in that regard, the Town Car wins again. It may not have magnetic dampers, but it has air suspension. Just like the Mercedes E63 AMG and Tesla Model S P100D. In fact, if you want an American performance sedan with massive power, RWD architecture and adaptive suspension you can choose between the Chevy SS, Tesla Model S and the Lincoln Town Car. Only one of those cars offers a front bench seat, though, so the choice seems relatively clear. If it’s not, allow me to put one more tally in the column of ol’ Abe’s namesake. In my experience, it’s incredibly hard to find examples of Teslas or Chevy SS’s with landau tops. Lincolns with such stylistic flair, though, are available in spades. This means it’s incredibly easy to get the dashing looks of a soft-top convertible while maintaining the torsional rigidity of a hard top. Not only that, but it gives you ample opportunity to experiment with two-tone designs. A car this exciting deserves that kind of daring color. Which brings me to my final piece of advice regarding Town Car purchasing. You do not want a black one. Most of the black Town Cars you’ll see are former livery vehicles. This, of course, because the fantastically rigid performance chassis of the Town Car was one of the only options that could be turned into a limo while remaining tighter and more rigid than your average AMG Mercedes or BMW M car. But those livery service cars lived hard lives, often neglected by the fleet companies. If you ever get in a Town Car that feels floaty and accelerates with the verve of drunken slug, that can be entirely chalked up to that example’s former life in livery service. Of course, some companies used silver or other muted colors, so I’d err on the side of picking a bright color no livery company would ever order. High mileage is also a plus, as it shows the car hasn’t been abused in the city. You’re also going to want to verify that the driver-side window control for the passenger window doesn’t work, a rare factory option that should increase value. I know this sounds complicated, so if you need help finding a prime example, just drop me a line. I might know a guy in Ohio looking to get rid of his.